I went to see A Scanner Darkly the other day. Great movie, by the way. I was also a big fan of the book. Anyway, it's directed by Richard Linklater who has also directed Fast Food Nation, the fictionalized version of Schlosser's book of the same name. So not surprisingly there was a trailer for Fast Food Nation before Scanner Darkly. 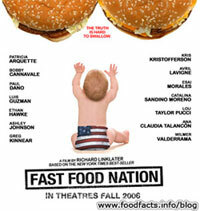 It was a new trailer I hadn't seen before or included on my Fast Food Nation movie info page. There's some pretty disturbing stuff in this new trailer and I've managed to find it at Hollywood.com. You can watch it here.